I really love that during 2016, the centennial year of the National Park Service, there’s so much publicity about the more than 400 properties that come under the protection of NPS. Early morning haze drapes the Chisos Mountains in Big Bend National Park. We try to visit different national parks in the U.S. every year, including returning to some of our favorites. So I’m thrilled to share that Big Bend National Park in Texas is the focus of an exhibit currently at The Bullock Texas State History Museum in downtown Austin. “Journey into Big Bend” is an educational program sponsored by Big Bend Chamber of Commerce, Forever Resorts, LLC, Gage Hotel, and Visit Big Bend. Even better, you can celebrate Big Bend National Park during the Free First Sunday program on May 1. Admission is free from 12 noon to 5 p.m., and there will be lots of free family activities until 3 p.m. For example, explore Texas’s ancient past by getting hands-on with fossils, make sun print works of art with plants native to the Big Bend region, and listen to a camping story. Rugged hills and mountains provide hiking opportunities in Big Bend. Smudge Studios will teach participants to take great nature photographs, and those skills can be applied to a challenge in the Museum’s exhibits. Staff from the Lady Bird Johnson Wildflower Center will also be on hand to share how they have worked to help improve Big Bend landscapes. If the exhibit inspires you to plan a trip to Big Bend National Park in the southwest corner of Texas, you’ll discover a variety of scenic, ecologic, and historic resources. Mountains, desert, and water combine to make a unique topography that was considered worthy of national park status by Congress in 1935. Nine years later the park was established to preserve and protect the unique U-shaped space where the Rio Grande River loops along the Texas-Mexico border. Rafting on the Rio Grande River is a special treat in Big Bend National Park. 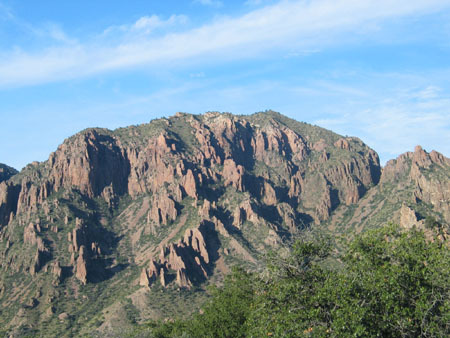 Encompassing more than 800,000 acres, the park is the largest protected area of Chihuahuan Desert topography and ecology in the U.S and the only national park that contains an entire mountain range, the Chisos, within its boundaries. It’s a land of dramatic contrasts—extremes in temperature, elevation, and moisture are found in the three distinct regions—so it almost seems like three parks in one. Tall cliffs border the Rio Grande in Big Bend National Park. The serene beauty of Big Bend inspires repeat visits from many travelers. Dark night skies glowing with millions of twinkling stars (no city lights to dim the view), steep river-carved limestone canyons, diverse wildlife and bird species (Big Bend boasts more types of birds, bats, and cacti than any other national park in the United States), rugged mountains, and uncommonly beautiful desert cacti and wildflowers provide enough enticement for 300,000 visitors annually. Big Bend is one of those places you can go back to again and again, and it’s like you’re seeing it for the first time. Don't miss this opportunity to learn more about the largest national park in Texas--for free.